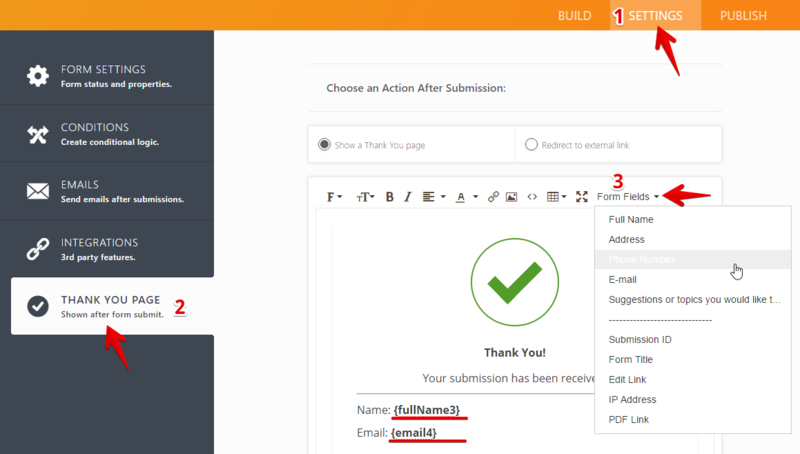 Update: We have a widget that allows your users to preview their form answers before they submit the form, use the Preview Before Submit Widget. This widget requires no further configuration. There are times that we'd like the users to review their answers after submitting their form or show to them some of the most important answers or generated unique ID codes on the Thank You page. Here's how to post user's answer to the thank you page. 3. In the thank you page, click Form Fields to add the field variables you want to show its data in the thank you page. I also need this thank you letter to have actual paragraph text. A summary text about the services we provided, with area's that would be prefilled based on information that they have just selected, and sent back to them via email. Can THIS be done? my uploaded files on the thank you page is in the full path form. For example https://www.jotform.com/haksjh/745973498573/pic.jpg. How do i make it so that it only display pic.jpg? Background image no longer showing properly on form & thank you! My form keeps going to a blank screen when complete - what setting do I use to make this go to my custom "Thank You" page??? Do you provide any API to read the subscribers DB? Thank You Page Wizard - Why is background transparent?